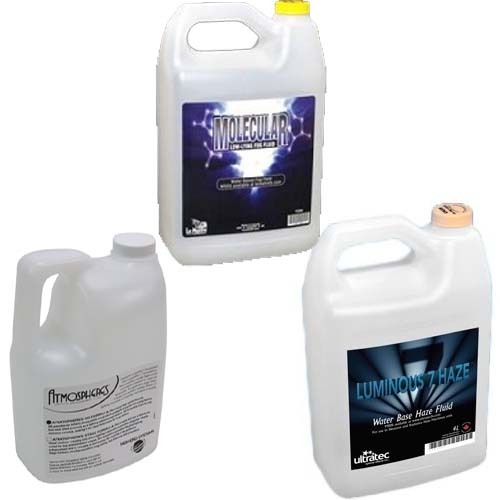 Need to purchase some additional Fog Fluid for your special effects machine, we can help! Elite Haze 10 (DF-50) is non-toxic, odorless and offers a long lasting hang time. Oil based Elite Haze™ is filtered and utilizes a blend of pure grade mineral oils to help prevent clogging and residue build-up. Luminous 7 – This fluid is specifically designed for the Radiance Hazer, it is a water based fluid that creates an evenly dispersed, dry, and long lasting haze. Water Base Haze Fluid – This safe, water-based fog fluid provides a consistent, long-lasting, dry haze effect that does not leave any residue. Molecular Low Lying Fog Fluid – A thick, clean, white fog that begins to dissipate as it warms. This fluid is an optimal solution for a dense low-lying fog effect when chilled with the LSG or LSX machines. Atmospheres Fog Fluid – Available in two different types, the “HQ” version which was the first developed and produces a longer hang time with a slightly more dense cloud when compared to the newer “stage” formulation. The Atmospheres fog fluid line is for use with High End’s FQ-100 or F-100 (discontinued version) Fog Machines. Categories: Accessories, Effects, Effects - Smoke / Haze, Perishables.